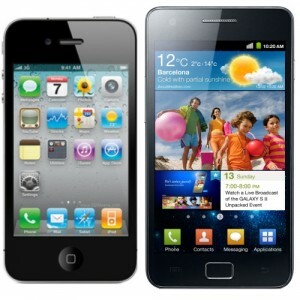 We compare the Apple iPhone 4S and the Samsung Galaxy S II – two of the world’s most popular smartphones. The two top smartphones of the year are the Apple iPhone 4S and the Samsung Galaxy S II. Both devices have seen impressive sales figures across the world leading to inevitable comparisons between the two flag bearers of the smartphone world. In this article, we compare the Apple iPhone 4S to the Samsung Galaxy S II. We look at the design of both devices, what lies under the hood (the processor and battery), compare the iPhone 4S’ Retina display to the Galaxy S II’s “Super AMOLED Plus” display and discuss the merits of the iOS and Android operating systems. We’ll also look at what it costs you to get the iPhone 4S or the Galaxy S II in the UK and compare the prices of both devices. Please see the disclosure notice for this article. In terms of the form factor and design, the Apple iPhone 4S and the Samsung Galaxy S II are fairly similar. Both phones are touchscreen-operated: neither phone has any form of physical keypad. Whereas the iPhone 4S only features only one hardware button on the front of the device (to return to the home screen), the Galaxy S II features two additional capacitive buttons on the front of the handset – one button on each side of the home button. These buttons correspond to the menu and back buttons in Android and disappear in normal use. They are stylishly lit up only when in use. In everyday operation, one of the most noticeable differences in the design and use of the devices is the Galaxy S II’s larger display (4.3-inches compared to the iPhone’s 3.5-inch display). The larger display makes the Galaxy S II marginally more awkward to hold than the iPhone 4S but is made up for by the device being slimmer and lighter than the iPhone 4S. The diagram to the right is approximately to scale. 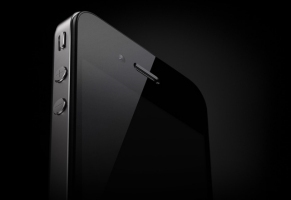 The iPhone 4S features a stainless steel antenna around the rim of the device. Looking beyond the front of the devices, the iPhone 4S positions both of its two stainless steel antenna around the rim of the device. This design featuring external antennae originally led to complaints of calls being dropped when the phone was held in a certain way but these problems are believed to have been fixed in the iPhone 4S. In contrast, the antenna in the Samsung Galaxy S II is hidden away inside the device. On the back of the iPhone 4S is a glass backing. The Galaxy S II has entirely purely plastic casing – there is no metal on the exterior of the device. 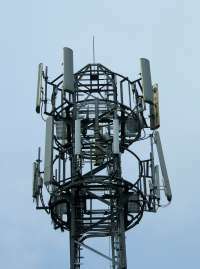 This improves phone reception as metal casing would give attenuation and degrade the mobile signal. The downside of phones with plastic casing is that they can feel “cheap”, easily gain fingerprints and be harder to grip than phones with metal casing. This is counteracted by the Galaxy S II’s use of the “HyperSkin” textured backing. The HyperSkin backing means the Galaxy S II does not pick up fingerprints and provides better grip than a standard plastic casing. Both phones are available in two colours: either black or white. The black edition tends to be the more popular choice for both phones. Both devices support HSPA+ connectivity – although the Galaxy S II supports faster download speeds. The iPhone 4S and Galaxy S II are both fairly well matched in terms of processing power. Both devices feature a ARM-based dual-core processor – essentially giving your phone two brains and allowing you to do more things on your phone at the same time. The ARM-based roots of the processor in both devices mean that both processors are designed to consume less power and to subsequently extend battery life. The iPhone 4S is clocked at 1GHz whereas the Galaxy S II is clocked at 1.2GHz. On paper this makes the Samsung processor faster but in reality, real-world performance depends on other factors such as how well written the software is and the speed of your internet connection. This makes performance a tough category to call. In terms of battery life, the Galaxy S II has the clear upper hand. The iPhone 4S features a 1420mAh battery next to the Galaxy S II’s 1650mAh battery. The claimed standby time and talk time is higher with the Galaxy S II and the battery is also removable in case you’d like to keep a spare battery in your bag (useful for long weekends away). For power users, an officially sanctioned battery with an extended capacity of 2,000mAh is available for the Galaxy S II. Both devices are designed to make it through a day though some iPhone 4S owners have complained this isn’t the case – many users have been complaining about the poor battery life on the iPhone 4S (though this may be due to a software bug). In terms of network connectivity, the Galaxy S II has the upper hand. Both devices support HSPA+ connectivity – a turbo-charged version of 3G connectivity which offers faster download speeds (if you’re on a HSPA+ enabled network such as Three). The Galaxy S II supports download speeds of up to 21Mbit/sec whereas the iPhone 4S only supports download speeds of up to 14.4Mbit/sec. This compares to a maximum possible download speed of 7.2Mbit/sec on older phones which lack support for HSPA+ connectivity. The Galaxy S II features a vibrant “Super AMOLED Plus” display. The Apple iPhone 4S features a 3.5-inch LCD display whereas the Samsung Galaxy S II features a 4.3-inch organic LED display (specifically a Super AMOLED Plus display). This makes the Galaxy S II’s display much larger in size – although the iPhone 4S’ Retina display packs more pixels into a smaller area. Both devices feature a capacitive touchscreen capable of multi-touch and gestures such as pinch-to-zoom. The most noticeable difference between the two displays comes from the fact the Samsung Galaxy S II uses a Super AMOLED Plus display whereas the iPhone 4S features a traditional backlit LCD display. In a LCD display, the backlight is covered with a layer of liquid crystals which can block certain colours coming from the backlight in order to give the desired colour. The Galaxy S II’s organic LED (OLED) display works in a different way: the OLEDs themselves are light-emitting and hence the amount of light emitted can be controlled directly. This means organic LED displays offer much better contrast (blacks are much blacker as individual LEDs can be turned off – a more satisfactory solution than using liquid crystals to block the backlight). The lack of a backlight also means OLED displays consume less power than LCD displays. The Samsung Galaxy S II’s display features “Gorilla Glass” which is chemically treated to be scratch-proof and to better survive drops. The iPhone 4S lacks Gorilla Glass – instead it features an aluminosilicate surface which isn’t quite as scratch-resistant as Gorilla Glass. All things considered, we prefer the Galaxy S II’s “Super AMOLED Plus” display. Colours are vibrant and blacks are very black so photos and videos look great on this device. The high contrast ratios and the larger screen size also means you’ll get a better multimedia experience. The drop-proof and scratch-proof “Gorilla Glass” is a handy addition too, especially if you’re prone to dropping your phone. Whilst the larger size of the display does make the phone slightly more awkward to hold at first (the Galaxy S II is around 10mm taller and 8mm wider than the iPhone 4S), this is a marginal issue and we got used to very quickly. We feel this issue is more than outweighted by the additional possibilities and benefits offered by a larger display. 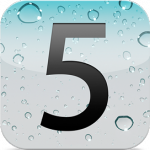 The iPhone 4S comes with the latest version of Apple’s iOS 5 operating system whereas the Galaxy S II comes with version 2.3 of Google’s Android operating system (Gingerbread) and Samsung’s TouchWiz 4.0 user interface. Both operating systems are easy-to-use, powerful and have a large range of applications available through their respective application stores (the App Store for iPhone and Android Market for the Galaxy S II). Estimates of the exact number of applications available on each platform do vary a bit but many estimates say there are at least 500,000 on both the iPhone and Android platforms with Android tending to have a larger proportion of free applications. Apps-wise, there are some notable exclusives on each platform: the iPhone 4S has the Siri voice control system whilst Android includes free turn-by-turn GPS navigation, 3D maps and speech-to-speech translation tools. The mobile world is divided on the iOS versus Android debate. At Ken’s Tech Tips, we prefer Android for its customisability and the home screen widgets which allow you to see relevant information from your applications without having to open each one individually. The integration with your Facebook contacts, Gmail address book and Google Calendar schedule are also favourite features of ours. Both devices feature ample storage for all of your holiday snaps. On the whole, both phones have plenty of memory for your videos, music files and photographs. The Apple iPhone 4S is available in three editions: either with 16GB, 32GB or 64GB storage. 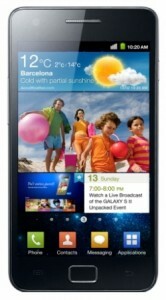 The Samsung Galaxy S II is only available in two editions: with either 16GB or 32GB internal memory. Both editions of the Galaxy S II support the ability to insert a micro-SD card of up to 32GB additional storage. We like the ability to add additional storage to your Galaxy S II: it makes transferring files a lot easier and you can always swap your micro-SD card around once it becomes full up of photographs. Micro-SD cards come fairly cheaply these days: a new 16GB card will set you back around £12 making this an inexpensive way to expand the amount of memory of your phone. There is no option to increase the amount of storage on the Apple iPhone 4S besides purchasing a new phone. The upgrade from 16GB to 32GB costs approximately £100 for the iPhone 4S. The Apple iPhone 4S and the Samsung Galaxy S II both feature very similar back-facing cameras: both feature an 8-megapixel camera with LED flash which is also capable of recording video in full high definition (1080p video). Engadget have a comparison of the photos taken in both devices with both devices snapping some good quality images. Where the iPhone 4S falls short of the Galaxy S II is in its front-facing camera. 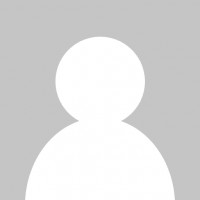 Front facing cameras are used for self-portraits and video calling – the iPhone includes Apple’s FaceTime whereas the Galaxy S II includes Google Talk. Video calling applications such as Skype are also available for both platforms allowing you to video chat with your friends around the world for free. The iPhone 4S features a front-facing VGA camera (0.3 megapixels) which disappoints next to the Galaxy S II’s 2 megapixel camera. 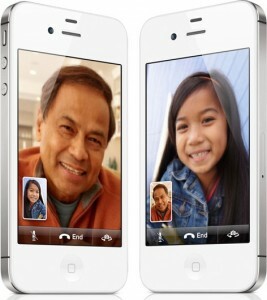 Furthermore, the iPhone 4S also lacks support for 3G video calling. This is a rarely-used feature for most people anyway although UK-based Giffgaff customers with a Samsung Galaxy S II could benefit from free 3G video calling. The Galaxy S II features a textured plastic back with “HyperSkin” technology. It sports an 8-megapixel camera. The iPhone 4S features the Siri voice control system which allows you to control your phone by speaking into it with natural language. The Galaxy S II features a similar system called “Voice Talk” which is powered by Vlingo. 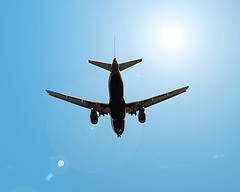 The downside of Vlingo is that it is necessary to learn specific commands such as “Play music” or “Check schedule” – expressing your commands in any other way (e.g. “Listen to music” or “Check my calendar please”) will not work. Siri’s voice control interface is more intuitive in that it isn’t necessary to learn commands – you can use natural language and it tries to understand what you want to do. One downside of Siri is that it’s usefulness in the UK is somewhat limited by the fact that the location-based features don’t work in the UK. We think that both the Apple iPhone 4S and the Samsung Galaxy S II are great devices in their own right – regardless of which phone you opt for, we think you’ll love it. In terms of which device is better, we’d call it for the Samsung Galaxy S II. The 4.3-inch Super AMOLED Plus display never fails to dazzle with its high-contrast display and vibrant colours and the lightweight and slim nature of the device makes it portable and practical. We’re also big fans of the Android operating system and with typical savings of between £100 and £240, your pocket will feel better off with a Galaxy S II. For those who currently own an Apple smartphone, the decision is less clear-cut. The iPhone 4S is a decent upgrade (see our comparison to the iPhone 3G S and iPhone 4) and with the iPhone 4S you’ll have a device & user interface you’re already familiar with. You can also keep all of your existing iPhone applications and data when upgrading to the iPhone 4S – something which is more difficult if you are moving to an Android-based device. 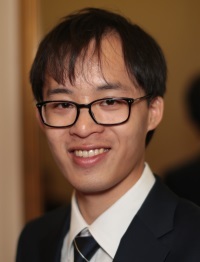 Disclosure Notice: The author of this article (Ken Lo) previously worked for Samsung Electronics at the Mobile World Congress in February to provide demonstrations of the Samsung Galaxy S II. The views expressed in this article are totally my own and reflect solely my own experiences of using both devices over the past few months. About the Apple iPhone 4S V Samsung Galaxy S II…..helped me to decide which one to get…Samsung Galaxy S II….The 4.3-inch Super AMOLED Plus display..battery life has the clear upper hand also removable… insert a micro-SD card for more memory.."Gorilla Glass"..with contract saving ££££….